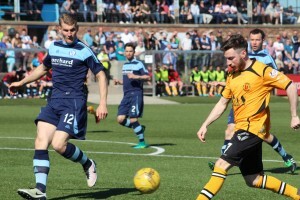 Annan Athletic ended Forfar Athletic’s title hopes on a glorious afternoon at Station Park in a 6 goal thriller. Jim Chapman made seven changes to the side that convincingly beat Montrose the week before but it certainly didn’t affect the Black and Golds as they head towards the play offs. It was the home side that started brightly with Cox threatening down the right and Lister looking dangerous in the box. Lister had the ball in the net in the early stages but the linesman rightly flagged for offside. The Forfar striker then collected a through ball to home in on goal but placed the shot wide. The early missed chances proved costly for the hosts as Annan took the lead against the run of play in the 14th minute. Callum Home’s free kick from wide landed kindly in the box for Peter Watson who made no mistake firing home to open the scoring. Lister continued to threaten the Annan defence with a couple of chances to equalise but Bronsky matched the striker to keep Annan ahead. Swankie hit a decent effort from 18 yards in the 34th minute but the shot was wide of the target. Annan capitalised on more missed chances by the hosts as they doubled the lead in the 36th minute. A ball over the top was collected on the chest of Osadolor as he turned and shot into the net past Grant Adam. Forfar were in shock and Annan continued as Max Wright put them three up a couple of minutes later. A fantastic solo effort as he dribbled into the box from wide before firing diagonally past the keeper. Forfar gave themselves a lifeline before half time as Travis pulled one back with a header from Denholm’s set piece. It was no surprise that the home side started the second half the more promising, pinning the Annan defence back, Mitchell making a good save from Swankie’s shot. Forfar pulled another back in the 54th minute when Annan failed to clear a corner. Lister drifted the ball back into the box and O’Brien headed in at the back post. Mitchell was to thank again for keeping Annan ahead with a brilliant save from close range to deny O’Brien in the 58th minute as Forfar went up a gear. Skelton relieved some pressure for Annan with a fantastic long diagonal ball to find Omar on the right wing, Omar put in a dangerous cross as Osadolor homed in but the defender got in front to block for a corner. The game started to open up again as Mckenna went through on the keeper but his lob beat the crossbar as well as the goalkeeper. Lister added another notch to his list of missed chances as he headed off target in the 75th minute. Finally the stirker looked to have the ball in the back of the net as he beat Mitchell, but a goal line clearance from Bronsky kept Annan ahead. With news that Stirling had equalised against Arbroath the noise from the fans cranked up as Forfar still had a chance of the title but Annan weren’t long in silencing them again with the deciding goal in the 89th minute. McKenna brilliantly collected the ball, spun and broke free of the Forfar defence. Being very unselfish he raised his head and squared to Aidan Smith who had burst a gut to get into the box and slot into the empty net. The result confirmed our play off opponents which already looked likely before hand and it will mean 3 meetings between the clubs within 7 days. Annan will face Forfar Athletic at Galabank on Wednesday evening with a 19:45 kick off before travelling back up to Station Park next Saturday.